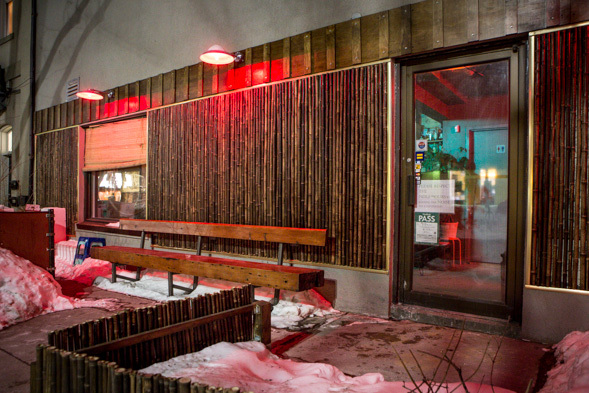 Hanmoto is a new destination for late night eats found just north of Dundas, west of Ossington. It's owned by Leemo Han of OddSeoul (and formerly Swish by Han ). The 30-seat restaurant is compact, housing both an open kitchen and dining room. It's been stripped down to raw brick and is furnished with salvaged pieces from Han's personal collection. This place, like Han's other restaurant, deals in dirty, greasy snack foods - mind you, not snack-sized foods. Unlike Oddseoul, this place doesn't major in Korean fare, but rather Japanese flavours and techniques presented in an unabashed and hulking American style. 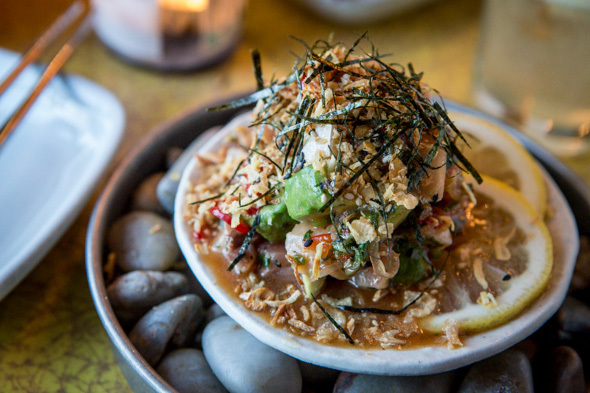 The kitchen is open nightly until 2am (with the exception of Sundays when they close) slinging raw plates of Hamachi tartare ($12) dressed in sweet chili ponzu and wasabi oil tossed with shiso, pickled shallots, and cubes of avocado. Nori, fried shallots, scallions and fresh cilantro finish the dish adding contrasting colours and textures. 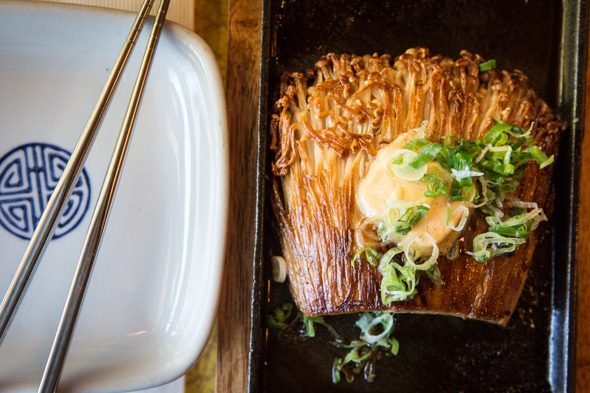 A whole cluster of enoki mushrooms ($7) in tangy ponzu sauce is served sizzling in a skillet with a knob of miso compound butter on top. Miso plays prominently throughout the menu and it gives many of the dishes, including this one, a lovely balance of sweet and savoury flavours. Dyno wings ($8) are a must! These are deboned chicken wings are stuffed with ground pork and bacon, like a gyoza that substitutes dumpling skins for chicken skins. They're deep fried to a crisp and served two per order in a Chinese take-out food box with Kewpie mayo drizzled over top, along with nori, cilantro and hot peppers. 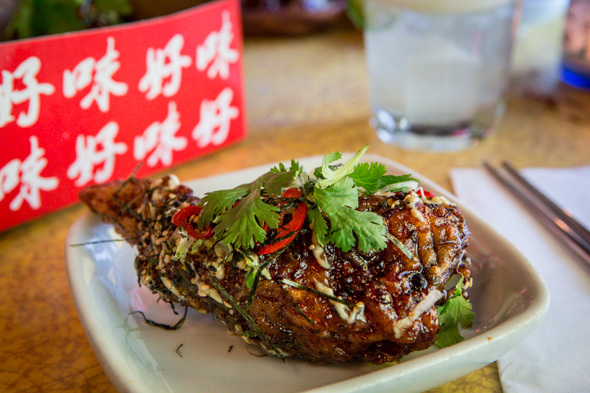 The katsu bun ($7) is unlike your typical fried pork cutlet, but it's a must try too. It resembles a burger, only the patty is a round slab sliced off of a sous vide pork belly that's then crusted in panko, deep fried, glazed in miso and sprinkled with sesame seeds. 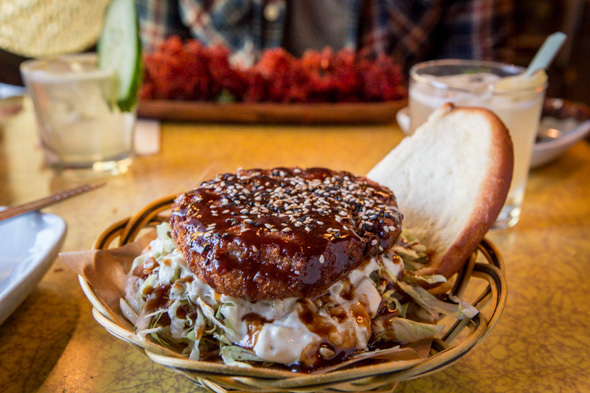 It's nestled into a deep-fried coco bun and dressed with soy remoulade and lettuce. 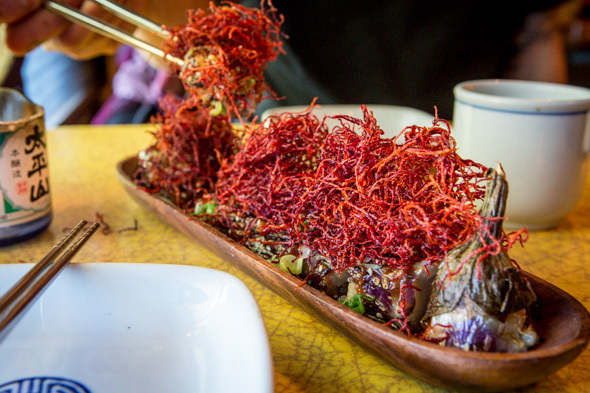 Nasu Dengaku ($8) is a delicious dish of deep fried Japanese eggplant with miso hollandaise to accentuate its natural sweetness, and a crunchy frizz of fried beets over top. 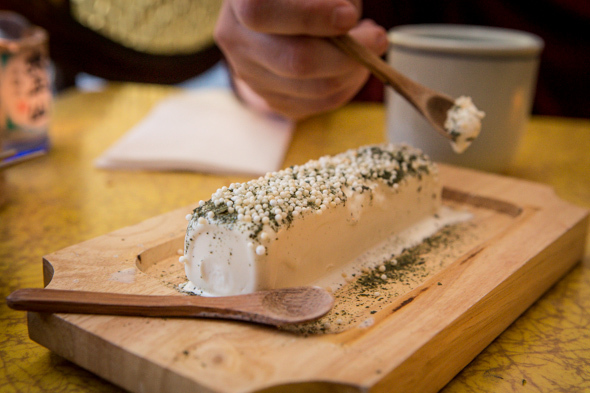 There is only one dessert and it's ice cream ($7), a frozen condensed milk base flavoured with sweet white miso then decorated with nori powder and crunchy puffed rice balls. The bar menu developed by Ihn Huh features a brief list of beers, a couple token wines, and classic cocktails updated with subtle Japanese twists. 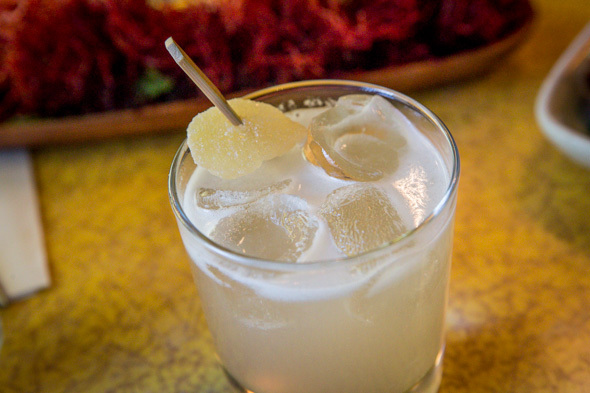 The Cops + Rabas ($13) for instance, is a blend of kaffir lime leaf-infused vodka with lime, ginger and ginger beer. 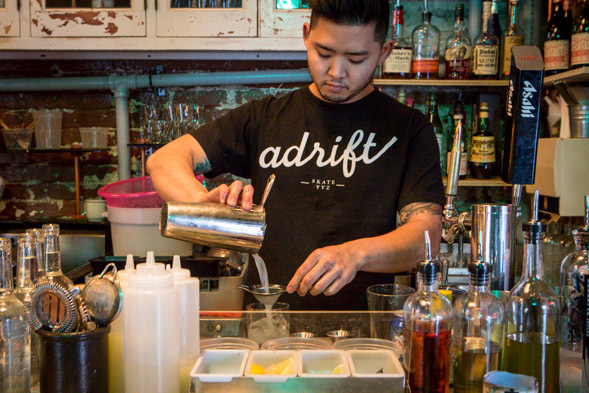 Like all the cocktails, it's meant to compliment the saucy, greasy food, and cleanse the palette between dishes. The food at Hanmoto is truly crave-worthy - the biggest drawback here is that when people find out, it's just going to make it harder to get a table.